This area, just east of the 2016 resurfacing remains in poor condition. BL stripe is 4′ from gutter joint. Warner Road, westbound west of Rural. 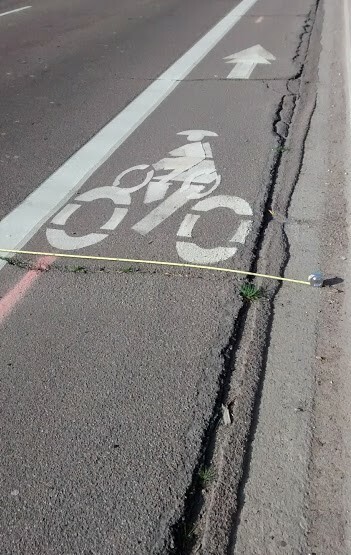 This is typical of “before” mid-block BL — exactly 48″ of usable space (I mean if the the road surface had no defects, which it clearly does) next to a 17″ gutter pan, for a total of 5’5″. This is also a graphic illustration of why BL usable width always excludes the gutter pan width. This area was not resurfaced in 2016. It should have been — the area around the longitudinal joint is bad the entire mile from Kyrene to Rural. The resurfaced segment was Dateland to I-10.